By this point a well-oiled machine, The Shaw Brothers studios operating out of Hong Kong had been pumping out swordplay and kung-fu films since the 1960s. By the mid-70s, the studio was operating at peak capacity with the finest efforts in the history of their catalog coming into play as their classics include this masterpiece, an adaptation of the Ku Lung novel of the same name which features both cast and crew operating at their high-flying best. 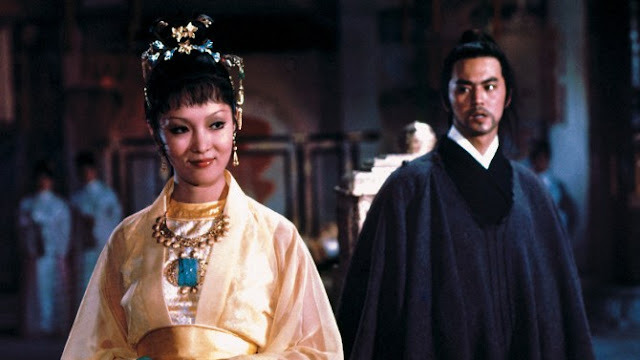 Resting in his palace, Yen Man-fei (Lo Lieh, of “Five Fingers of Death”) learns that his old nemesis Fu Hung-hsueh (Ti Lung, of “The Avenging Eagle”) has arrived for a duel and begin their fight. Before long, however, a series of assassination attempts on the two convinces them Kung-tze Yu (Ching Tang, of “The Black Enforcer”) has designs on a mystical weapon known as a Peacock Dart. Entrusted with protecting the weapons as well as Yu Chin (Lily Li, of “8-Diagram Pole Fighter”) the owners’ daughter, they set out to uncover the truth about the assassination attempts while trying to settle an old conflict between the two of them. This turned out to be quite the enjoyable and effective effort. As was typical of the time, the fighters wield fantastic weapons, are able to survive ordinarily-mortal wounds and leap up over two-story buildings in a single bound. Beyond that, there's plenty of martial arts acrobatics to wonder at, including numerous sequences where hordes of swordsmen fall victim during the onslaught, a fantastic sword-fight finale and the confrontations with several assassins to keep the film going. These are expertly choreographed by Chia Tang, ensuring even the briefest of assassins to appear on-screen look good, while the various hordes of opponents being taken out are quite impressive to behold. Given that, the cast here does respectable jobs. Both Lung and Lieh are such professionals by this point their competence is expected. Lung’s Hung-hsueh, being more quiet and stoic, comes off rather one-note but that’s from the story rather than his performance, as he plays the part well and looks in fine form during his fight scenes. Lieh’s Man-fei, by design more bewildered and confused, is better as his complete surprise by everything, the deeper into the plot they go, is a believable and likable character. With reliable stalwarts Lily Li, Norman Chu, Fan Mei-sheng and Ku Feng also in the cast, this one manages to feature some solid, skilled workers that don’t embarrass themselves yet can hold their own in a fight. The real standout, however, is Teresa Ha Ping as the Devil Grandma, who is quite chilling and creepy in her scenes and serves an appropriate nuisance to the duo. The direction by Yuen Chor is one of his finest efforts for the Shaw Brothers studio. Taking a more European-centered take on the sword-fu genre, he favors more dramatic, long-take camera movements rather than the traditional quick-cut editing favored at the time. From high-angle POVs to long tracking shots, this one plays more European in its look and feel than most of the studios’ contemporary titles. The lavish sets, including the elaborate full-size chessboard and the main temple for the final battle are woven into the film rather nicely while retaining that traditional Shaw Brothers feel, giving this an effective mix of both styles. However, if there’s a flaw here it’s the films’ story. 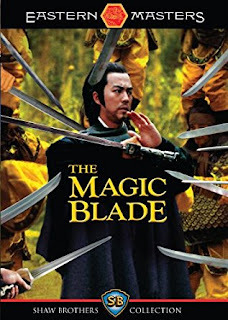 While adapted from the novel by Ku Lung, "Magic Blade" still seems way too convoluted and complex for its own good. With way too many characters in the film, including a useless sojourn where Hung-hsueh meets up with a starving prostitute that doesn’t need to be there, alongside the numerous assassins that are all after the weapons,the film does have characters that don’t need to be there. Likewise, an interesting twist brought up at the end could’ve been explored further. Initially, Hung-hsueh is told the true villain of the piece doesn’t exist, that Kung-tze Yu is a mythical being rather than a physical perso,n and he has now become that person. Just then, a figure emerges and claims to be the real Yu, ruining a great philosophical ending. However, these issues really harm this one. Still one of the better entries in the Shaw Brothers catalog, "The Magic Blade" entertains mightily with plenty of solid kung-fu action, a mythical weapon and a rather enjoyable style that gives this a lot to like. While there are a few minor issues with a lackluster story and overcomplicated by side-characters, the film belongs in the second-tier of the studio’s efforts and is well-worth the effort for fans of kung-fu cinema.